Welcome to Zippie Too in the Smoky Mountains! 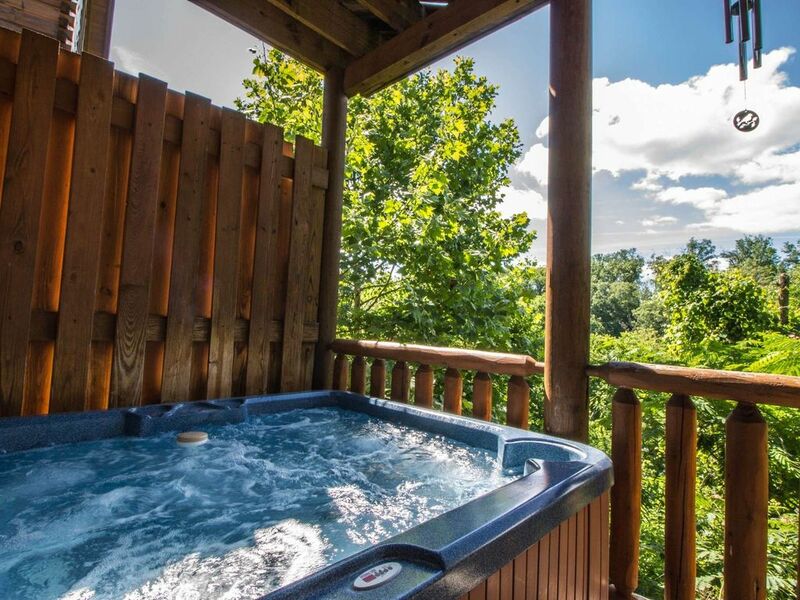 Our log cabin rental offers you the perfect place to escape, explore and discover the Smokies! Located in the enchanting Grandview Mountain Resort, you will have access to an on-site zip line course and seasonal swimming pool to keep everyone entertained. * Luxurious MASTER SUITE w/ King Log Canopy Bed, Romantic Bedside Jacuzzi Tub, Flat Screen TV, Private Bathroom with Walk in Shower & Your Very Own Balcony Access. * Open concept bedroom w/ QUEEN Log Canopy Bed, Flat Screen TV, Open Sitting Area with Queen Sleeper Sofa and Balcony / Deck Access. * The Hot Tub is located on this level. As soon as you enter this gorgeous log cabin getaway you’ll immediately notice the beautiful natural wood accents and soaring cathedral ceiling above with exposed beams. The relaxing living room provides you with an open floor plan, stone accented fireplace, flat screen TV, deck access and a pool table for your entertainment. Adjoining the living room is a fully equipped kitchen that is the perfect place to prepare, cook and serve a delicious meal while you’re on vacation in the Smoky Mountains. There’s also a nearby dining table and eat-in kitchen bar with stools to provide seating for our guests. Kick back and relax while you’re on vacation on either of the two covered decks. Here you’ll find comfy rocking chairs, an outdoor hot tub, and BBQ grill for your enjoyment during your stay. While you’re visiting, you can also take full advantage of Cable TV and complimentary WiFi internet access. Zippie Too is a remarkable and spacious Smoky Mountain vacation rental providing you with exceptional amenities that will certainly make for an unforgettable vacation experience. If you’re looking for the perfect place to escape, this is it! Reserve your stay today! The cabin was very nice and clean and had everything you would ever need. Not a big deal but the only thing you might want to address was the tv in the living room would not connect to the satellite. We had a great time and would recommend it to anyone. Clean, Beautiful area, great location, had everything we needed, loved it!! Thank you for the review. We are ecstatic to hear that you enjoyed your stay and that it met all your expectations. We would love to host you and your family again. Please come back and stay with us. Clean, beautiful area, great location, loved everything about it! Zippie Too is a very nice cabin. Lots of space for 4 adults & 4 kids. Nice view of the mountain, easy access ( we drove my car), loved using code to get in the door. Very well stocked kitchen & bathroom. In a nice area. Thank you once again for staying with us! Please come again! Great place would definitely stay again. This is one of the best vbo places ive stayed at yet. Thanks so much for letting us enjoy your home. We won the lodging lottery with Zippie Too - this was the perfect setup for my husband, two teenage daughters and myself. We couldn’t have asked for anything more. Hope to stay here again in the future! Pigeon Forge vacation rentals offer guests more than just your typical vacation. Tucked away in the foothills of the Smoky Mountains in Tennessee, the climate of Pigeon Forge is almost perfect with balmy summers and moderate winters, making it a perfect destination during either season. With endless entertainment and fun, our Pigeon Forge cabins or condos are the ideal vacation spot for all kinds of vacationers. The Smoky Mountains make a picturesque backdrop for your Pigeon Forge vacation rentals. If you're itching to get back to nature there are many ways to discover the natural wonders of Pigeon Forge. The Great Smoky Mountains National Park boasts over 800 miles of hiking trails, sightseeing and exploration. Or for a more unique experience you can tour the diverse wilderness by helicopter, Hummer, bike, horse or water. Get an up close and personal view of the beautiful Pigeon Forge waterfalls, wildlife, and plant life. Our Pigeon Forge rentals are also near a number of great family friendly attractions for the whole family to enjoy. Visit the many amusement parks, live entertainment, master craftsmen demonstrations, and more. While you're there be sure you catch Dolly Parton's Stampede Dinner Attraction, an action-packed show complete with a four-course dinner. For some educational fun not far from your Pigeon Forge cabin or condo, visit Titanic Museum, the Guinness World Records Museum, Ripley's Aquarium, or Wonderworks. The kids will be having so much fun they won't even realize they're learning while they play! After a day of excitement, refuel at any of the many delicious restaurants located near your Pigeon Forge cabin or condo. Find the perfect restaurant for all appetites, while enjoying a high class dining experience. For some after dinner fun, visit the many shops available and find that perfect souvenir to bring home to friends and family. Spend the night strolling downtown, relaxing, before heading back to your Pigeon Forge rentals. All of our Pigeon Forge vacation rentals guarantee an amazingly relaxing stay without the hassle. Each rental offers luxurious amenities, high quality accommodations and services, and infinite comfort and fun. iTrip offers a variety of rental styles and sizes that can accommodate all group sizes, from families to couples. No matter which of our Pigeon Forge condos you choose, you’ll experience the best lodging experience you’ve ever had. We promise to fulfill all your vacation desires and more. Begin planning your trip of a lifetime and book your Pigeon Forge vacation rentals easily with iTrip today.